The announcement came after unprecedented Oval Office talks with a top envoy from Pyongyang. US President Donald Trump and Kim Yong Chol, one of leader Kim Jong-un's closest aides, at the White House today. US PRESIDENT DONALD Trump has confirmed that his summit with North Korean leader Kim Jong-un will go ahead as originally planned on 12 June in Singapore. While admitting that dealing with North Korea was “going to be a process”, Trump said he believed that process would ultimately be “successful”. 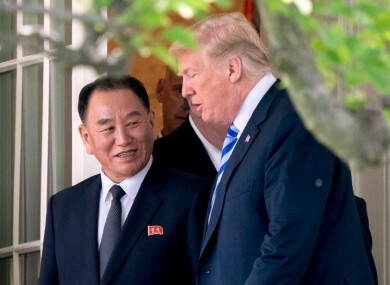 Trump said a letter from Kim, hand-delivered by Kim Yong Chol, was “very nice” and “very interesting”, without immediately disclosing its contents. Speaking after more than an hour of talks, Trump told reporters that denuclearisation — and a formal end to the decades-old Korean War — would be on the table in Singapore. But the US leader warned that he did not expect to immediately sign a deal to bring a halt to the North’s nuclear programme. “I never said it goes in one meeting. I think it’s going to be a process, but the relationships are building and that’s very positive,” he said. Trump said they had discussed formally ending the Korean War, which has been largely frozen since an armistice ended hostilities, but not the underlying conflict, in 1953. Since then, there have been occasional clashes on the divided peninsula. “We talked about it. We talked about ending the war,” Trump said. Historically it’s very important, but we’ll see. We did discuss that, the ending of the Korean War. Can you believe we’re talking about the ending of the Korean War? Washington is determined that Kim should agree to what US officials call the “complete, verifiable and irreversible” end of North Korea’s nuclear weapons and intercontinental missile programs. Kim says he is committed to “denuclearisation” in some form, but he is expected to demand security guarantees — one of which could be a formal end to the conflict with the US and South Korea. Most expert observers are sceptical that even an unprecedented summit between the two leaders can lead to a rapid breakthrough, and Trump admitted it would be a long and difficult process. “We’re not going to go in and sign something on June 12. We never were. I told him today, ‘Take your time’,” Trump said, adding nevertheless that he expects “a really positive result in the end”. Kim Yong Chol, vice chairman of the ruling party executive and the most senior North Korean to visit the United States in 18 years, spent almost 90 minutes in the Oval Office. Email “Trump says meeting with North Korea is back on after Kim's 'very nice' letter”. Feedback on “Trump says meeting with North Korea is back on after Kim's 'very nice' letter”.